← You may think you know Prezi, but do you really? Where do Mobile Devices Fit in Higher Ed? Posted on November 5, 2012 by Jessica Gaido | Comments Off on Where do Mobile Devices Fit in Higher Ed? We know you’ve experienced it—that moment when you turn away to jot down some notes on the board for your class and turn back and half of your students seem engrossed in their mobile devices, ipads, laptops, etc. 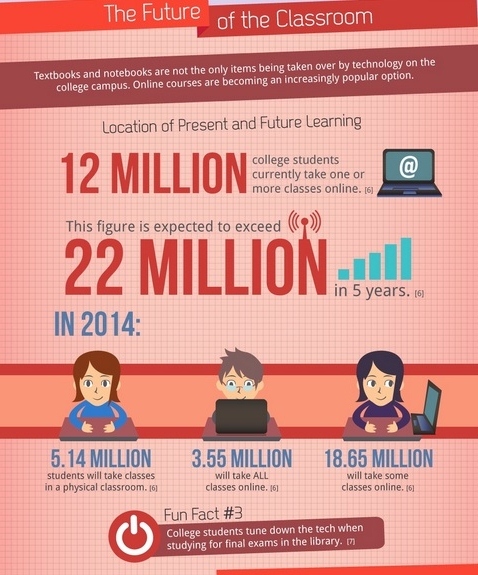 Students and their technology devices have become essentially attached. And while this may seem inconvenient when it comes to teaching in the classroom, it also has great perks for higher education. Check out this portion of an infographic we found to get a better look into exactly what technology tools your students are using, and what they are doing with them! To view the full infographic (with tons of neat information!) click here. This entry was posted in Helpful Tips and tagged iPads, Laptops, Mobile, The Future of the Classroom. Bookmark the permalink.